Membership in the Industry Studies Association is open to scholars from every academic discipline, researchers in government agencies and non-profit organizations, and other persons who are supportive of the Association’s mission, which is to advance industry studies scholarship. We encourage participation by all those who seek to ground their research in the deep knowledge of particular industries. The key to participation is shared commitment to a research approach that places great value on direct contact with industry for insights, data, and observations. 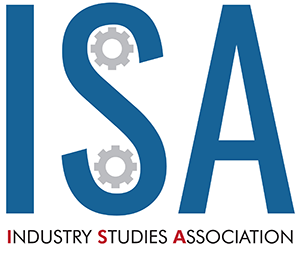 Scholars who focus their research on industry, including non-profit activities, by making the kind of personal investment that is necessary to engage with industry practitioners are welcome to become Industry Studies Association members. Equally welcome is any scholar who wants to engage in formal or informal collaboration that benefits from such investments. An annual conference that allows members to interact with one another and provides a venue for the development of working papers and the dissemination of findings from ongoing research. Research discussion groups and forums, including access to the industry studies listserv where information is shared about new developments, conferences, workshops, and subjects of interest in industry studies. An online membership directory to assist with the identification of possible workshop participants, seminar speakers, potential collaborators, and experts in complementary fields. Awards that recognize excellence in industry studies research and thus promote awareness of innovation in research methods and help to disseminate important research findings. Currently, dues are $200 for Supporting Members, $110 for Members, and $55 for Student Members.